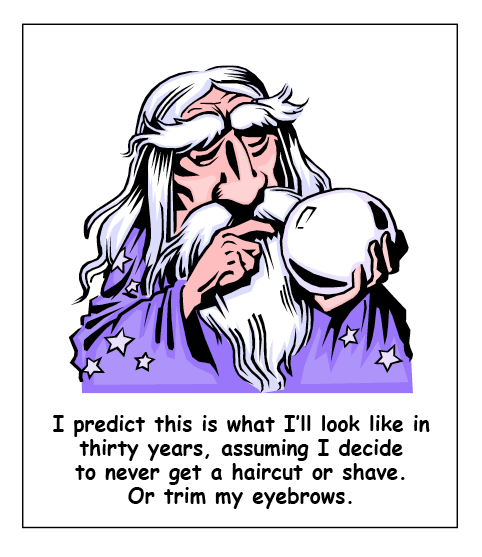 Predicting the future is a tricky business, and the results are usually less than impressive. Take, for example, all of those world’s fair exhibits that have attempted to portray life even just a couple of decades ahead. What we always get are flying cars, highways devoid of traffic jams, entire meals in a pill, and wisecracking robots that cook our breakfast and iron our shirts. Technology keeps promising to bring us increased leisure, good health, sparkling air, and maybe immortality. At least that’s the message. Have technical advances made a big difference? We really still have the same lives we’ve always had, except now we can send messages filled with misspellings and grammatical errors to almost anyone in the world, while ignoring family members who are seated right next to us and who are growing increasingly irritated because they’ve asked us three times if we’d like more potato salad. But while I hesitate to engage in prophecy, there are certain things I have to believe are true, or will be true. Fifty years from now, will people still be rebuilding their homes after a devastating tornado has blown through their small Midwestern town? Will our only response to these killer storms continue to be restricted to driving in a zig-zag pattern or cowering in the basement? No, we’re smarter than that. What is a tornado, after all? It’s a bunch of wind blowing around really fast in a circle. Someday we’ll discover that if we can get some air blowing equally fast in the opposite direction, the two forces will cancel each other out, and we’ll be left with a nice breeze. In order to accomplish this, I imagine huge circular fans mounted on rolling platforms that can be moved to wherever there’s an approaching tornado. Hundreds of lives will be saved, as well as billions of dollars in property damage. Meanwhile, a Save-the-Twister campaign is sure to form, as well as protest groups complaining about the hum of the rotating blades and the cancer-causing effects of the electromagnetic fields they generate. The climate in general will always be a problem, because we’ve somehow gotten it into our heads that we have a major influence over the weather. This is another result of our ability to talk to everyone, and the fact that we can fly anywhere in the world within a day. It’s easy to forget how big the planet is, and how small we are. And we’ll continue to forget, eventually boxing ourselves into a place where everything we do points to imminent disaster. Once we’re completely paralyzed, immobilized by the fear that even our shadows are destroying the environment, the pendulum will begin its inevitable swing the other way, and we’ll again assume it was something we did. We’ll feel nervous when the climate seems stuck and unchanging for a while, and terrified when it appears to be cooling down a bit. I do believe the world’s fair exhibits were right about one thing, and it’s that sooner or later we’ll figure out how to acquire more leisure time. Several countries in Western Europe already have this knowledge, of course, but they squander it on expensive lunches and a lot of rich foods loaded with cholesterol and things that clog their pores. The rest of us are either tired of commuting to work or sick of standing in line at the unemployment office. We want to free up bigger chunks of our day for napping, exercise, yoga, or just gazing wistfully at the landscape. But mostly for napping. It’s important that we consider how to put at least a few of those extra hours to good use. We could try thinking. I don’t say this to insult anybody. I do a lot of thinking myself, but it tends to be the pointless variety, like trying to understand why there are eighty-nine different kinds of vacuum cleaners when there are only about three different kinds of floors, or wondering if there’s any truly safe method for putting on my underwear and pants at the same time. I’m pretty sure that within two or three decades, we’ll be recording our thoughts and storing them directly into a digital format. This will eliminate the need for writing and reading. Our grandchildren will view our books, newspapers, and e-readers as quaint and obsolete, much the way we look at hieroglyphics, knee breeches, and television sets that have knobs. How will future generations remember us? For the most part, they won’t. But historians will look back and acknowledge that we were most significant for our unsurpassed obsession with germs. They’ll describe our century as one in which millions of people lived with daily exposure to malaria, tuberculosis, and other infectious diseases, while millions of others ran to sanitizers whenever they touched an unfamiliar surface or came within four feet of another human being. I used a public bathroom recently, and mounted over the sink was a chart by the World Health Organization that illustrated the proper way to wash your hands. It had twelve steps, which were inexplicably numbered 0 to 11, and used specialized terms like left dorsum, but for some reason felt the need to explain that you wet your hands with water. I suspect that researchers in the next century will find that curious. Just as likely, though, they’ll be too busy dodging tornadoes or taking naps. It’s also possible that nobody will be much interested in the past, and that people, even then, will still be foolishly attempting to predict the future. In the twenty-four hours since I published this post, tornadoes have destroyed dozens of homes and businesses in at least four states. Many people have been injured and a few have been killed. It happens every year, and it’s sure to happen again. Clearly, this is no laughing matter. I really wonder if there’s a solution, and if someone will figure it out before too many more people are hurt. Winter has ended five or six times so far, Linda. April is always the hardest month, because my New York brain thinks it should be getting progressively warmer, but it seems to get colder as the weeks go by. There’s no sign of spring, and then suddenly it’s summer. Thanks for the invitation. I can’t wait to read your latest post. Amen. I am one of your said nap enthusiasts. My lethargy largely needs to be addressed. Strangely enough i was thinking the very same thing just recently. About perceptions of the future that is. After watching the fifth element for the 500th time I found myself wondering why we’re still not the slightest bit closer to highways in the sky. Don’t you just love 90’s movies? Actually, I have noticed lately that most of the DVDs I’ve been watching are movies from the late ’90s. I always wonder what the English language will sound like in another hundred years — it would probably be incomprehensible to us. I hope the baby is doing well. I’d marry you if I hadn’t already promised myself to so many other wits. Maybe we could all become Morons. Whatever you have in mind for our grand children I don’t want to know. I have barely recovered from Orwell’s 1984 having come true with big brother watching our every step and the make of washing powder I prefer known to people unknown to me. To think there was a time when I was frightened out of my wits that God not only sees everything but is a bloody mind reader too. I call it BCCTV (before closed-circuit television). As to germs: Insert ‘an’ at the right place and you have Germans (and they are almost as clean as a Swiss dairy). Here, in the UK, hospitals have become a MENTAL health hazard: If you so much as cough you are invited to stay outside.. A couple of years ago I limped into A&E (accident & emergency), barefoot like the Contessa herself;:two arms broken I hadn’t been able to put on shoes. No shoes? Not even flip-flops? I unleashed not so much passion as the health and safety police. I won’t ask how you managed to break both arms, Ursula, but I am a little curious. And I’m pretty sure that if we could see germs, we’d feel ridiculous about our delusion that we’re avoiding them by using an occasional hand sanitizer. The fact is, our own bodies contain more bacteria cells than human ones. Not a pleasant thought, but true, nevertheless. And, yes, I was equally unnerved by the idea that God could read my thoughts. I eventually realized that we have no control over what we think, so there was little reason to worry. what’s a left dorsum?? i totally laughed my way through this, it’s so funny because it is so true! It means the back of something. I know that because I just looked it up. I don’t get it either, Niki. We’re swimming in germs, and it’s a good thing, too. Our immune systems need the workout. Another great post, Charles. I’m grateful for the technology that has allowed us to communicate so effortlessly with people all over the world (some of them as far away as Canada even! ), but I, like you, wish more people would exert a little more effort in sending messages that aren’t cluttered with grammatical errors and misspelled words (sorry–English teacher ranting). And as a Midwesterner whose weekend weather forecast includes the threat of tornadoes, I like your idea for preventing them–can you get right on that? And, as someone who is only months away from freeing up some major chunks in MY time, I promise to devote a tremendous amount of that time to “thinking”–which should probably frighten you and every other person with some degree of sanity and common sense. However, I also promise to counter-balance my thinking with increased napping, which will allow you and everyone else time to take cover. Far from being frightened, I look forward to the time when you’ll be free to do more thinking and writing. I hope this week’s workshop will be inspirational, and that your wonderful blog will soon be just one part of your new career. Thank you, Karen, for your ongoing support and encouragement. You’re very welcome … and thank you as well. Having more time to do nothing would be wonderful. The weekends just aren’t long enough. Your title “Funnel Vision” is also the title of a book by a friend and former co-worker, Chris Kridler. She’s a storm chaser and I bet she would be very intrigued by machines that could cancel out tornadoes. If only we did have the ability to wipe out natural, reoccuring disasters. A very thoughtful and funny post, Charles. I don’t often advocate tampering with nature, Judy, but this is one area in which I think we can prevent a lot of suffering. It seems possible. And it isn’t as though there’s some side benefit to tornadoes — they’re pure destruction. I’d stand up an applause but I’m afraid people would stare… On that note, I thought I could run a successful pyschic hotline. I’m an excellent educated guesser. I have enough life experience at 35 that, when I am sought out for advice, I can generally predict what’s going to happen. People think I’m psychic already. We’ve gotten out of hand as people. We are also getting dumber and I blame convenience. I don’t think books will actually disappear anytime soon, Nicky. But it isn’t hard to imagine a time when everything will be published and distributed electronically. It seems inevitable. I love your idea on the Tornadoes you just never know what type of technology is around the corner. 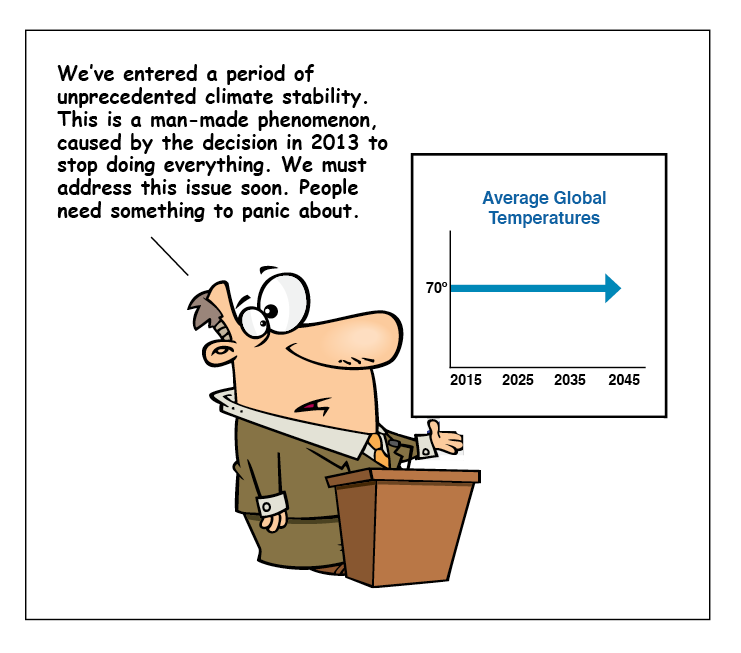 I had a good laugh at your cartoon about the climate, so very true, the powers that be are always thinking up something as a scare tactic. I don’t know what the Vikings thought, Mags, but I doubt they would have accepted the blame for global cooling. And we haven’t even hit hurricane season yet. And those must be the untrimmed nose hairs growing out over your upper lip, there, dude! Yes, I needed a nice dose of bright ideas. 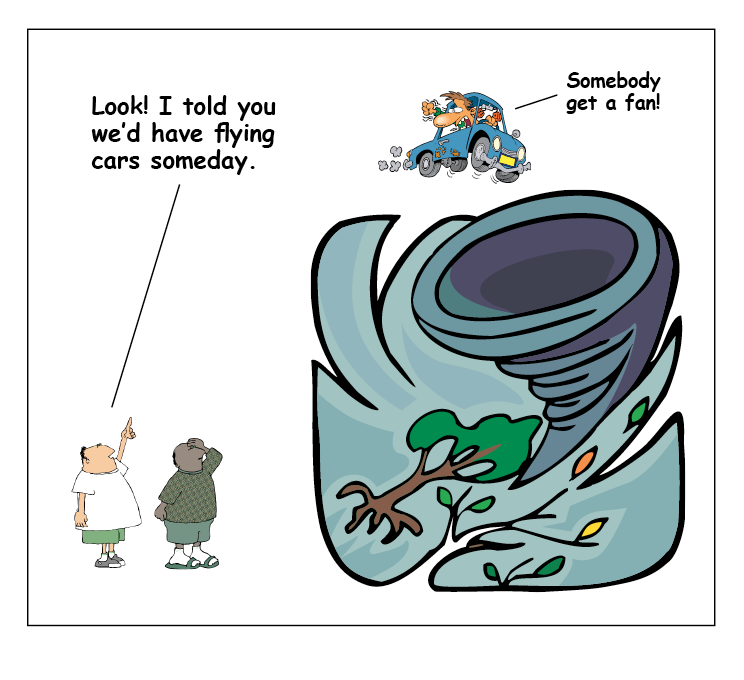 You really oughta get a patent on the anti-tornado fans! Thanks for the much needed break. The problem with the big fans is the really long extension cords they require. I’m still trying to work that out. Charles…I was amazed when I realized that in the Catholic, United and Anglican churches, each Sunday’s readings are a thread of predictions and prophesies. The poor clergy are left with the dubious task of taking that thread and showing how the Old Testament prophecy is borne out in the New Testament reading. No wonder all three churches use this same liturgy. Some threads are so stretched that my Rector occasionally came very close to swearing as he tried to prepare his sermon. I think that was the smoke that came out of his ears. If it was the beginnings of a halo, someone ought to have told his face. I suspect that at least some of the New Testament was written to make it appear as though the Old Testament prophecies had been realized. The result, often, is a series of strange stories. Thanks for the comment, Amy. My oh my, Charles, you’ve discussed some of my most favorite rants here. I think you’re exactly right about the weather; If we get so big-britches-self-important as to mount Tornado Busters in Kansas and Oklahoma, the tornadoes will just move to Montana and laugh at us as we scramble to air lift the huge machines across country. Global warming is a myth carefully crafted by Al Gore (right after he invented the internet just for this purpose) to sell books and become a millionaire. I suspect he also started the germ warfare movement whereby we must avoid/exclude/annihilate every germ within our living environment. The problem is that if we never encounter any germs our bodies never develop a resistance and the very first time we slip up and a microbe gets through our chemical shield, we die a horrible death. And the time saving devices? How is it that in a home just PACKED with time and labor saving devices we are still over-worked and tired? Maybe we should spend some of that saved time trying to develop a virus that will infect tornadoes and sap the strength out of them instead of trying to come up with new drugs to treat the diseases we contract when we kill the germs that protect us from other germs. Thanks for the reality break – great read. I’m glad we’re actually powerless to destroy most germs, Allan, even though our disinfectants claim to kill 99.9% of them. The ones that are left would wipe us out in a couple of weeks. I have to say, I do enjoy reading your creations (and your hilarious cartoons), but this time the prize for the longest giggle went to the WHO for their tagline “Save a life”. As a biologist I cannot subscribe to killing millions of germs in the name of mankind’s survival. Find your humanity, people! I really liked the disclaimer at the very bottom: “The responsibility for the interpretation and use of the material lies with the reader. In no event shall the World Health Organization be liable for damages arising from its use.” It’s a good thing they have that in writing, because I got some soap in my eye between steps 3 and 4. Charles, just so you know – there is a way to put on your underwear and pants at the same time, but it would involve a crowbar and a lot of paper towels. See, you’re not the only one who thinks about this kind of stuff. Thanks, Susan, but if it involves a crowbar, I think I’ll keep doing it the slow way. Although time management is a good thing, I have to draw the line somewhere. Love the solution to tornadoes. 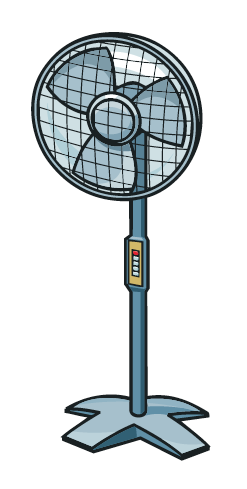 I’m going to invest in some fan stock immediately. I’m baffled that Google seems to know what I’m searching for before I do in a freakish big brother way so I’m guessing it will read minds soon. The tendency to know less started quite a while ago, and now it seems we’ve begun to think less, too. Eventually, there will be little interest in reading minds, because there won’t be anything to read. That’s my real fear. After reading such a great post what is left for such a humble writer as yours truely to say? Nothing. Really. Except thanks awfully and please could you pass the potato salad? You may be humble, Rosie, but you’re a wonderful writer. Thanks to you, too, and please pass the gelato. I’m going to the beach and for gelatos tomorrow (guests from out of town). I’ll be sure to send you a double pistachio scoop in the mail. After we take care of the tornadoes, we’ll have to deal with those tsunamis and earthquakes. Thanks for the song lyrics, Govind. Having seen a good bit of the world lately, I can tell you with certainty that most of the folks are not sitting around waiting to “friend” somebody, they are just trying to figure out how to grow enough food to eat and send their kids to school, which is oddly comforting and quite nice to be around. They’re also not trying to control the weather – they’re just hoping that the “advanced civilizations” don’t screw up the entire planet before they get a chance to drive and watch TV and yes, take a nap. 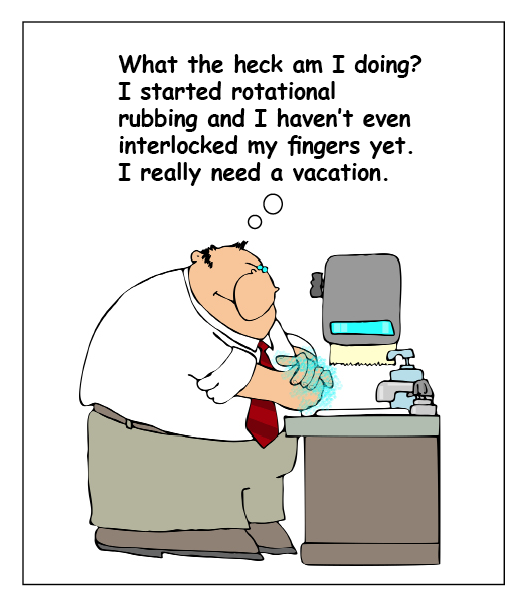 Love your post, as usual … and I am always amazed at the way your mind works….overtime! One of the things that always comes through when I read your blog is just how hard people work, and how grateful they seem for the relatively little they get in return. Your latest post about Peruvian weavers highlights their beautiful work — spinning, dyeing, and knitting alpaca fleece into incredible finished products. It’s hard to avoid wondering who really has the advanced civilization. Twelve steps to hand washing? What happened to rinse, lather, repeat? Now I have anxiety that I have been neglecting nine precious steps and may have exposed myself to dangerous germs and…oh wait…I’m still here. It must be ok. I read recently that they discovered the cause of cancer. It is laboratory mice. Tehehe. Thought you’d like that one. Imagine how many extra hand-washing steps those lab technicians must have. I am terrible at writing replies. I am always that kid back in school not really sure of what to say or how to say it. Sensing my failure at this I can only say that I enjoyed the workmanship of your post and its subject. Fitting words together is a great puzzle hardly working for me at times until I try and try again… so it is delightful to see that you know how to complete the puzzle and make people smile at the same time!!!!!! I hope that I NEVER hit the publish button in error, before I finish a piece….and oh so not at the beginning. It is a wild eyed mess, but with a lot of work it gets easier for my part! Some parents teach their kids to sing the ABC song while washing their hands so they wash long enough. That would eliminate a lot of steps from the poster. Regarding future inventions…I’d love a device that takes the “great idea for my novel” that I get just as I crawl into bed at night and beams it electronically from my brain to my word processing software. Wouldn’t that be cool? I’ve also heard that you should sing “Happy Birthday” all the way through, twice, while washing your hands. That might work at home, but in a public bathroom it could be awkward. I think the idea of beaming thoughts into a word processing program will really happen someday. I’m sure there will always be a need for editing and revising, though. What sounds good in our heads doesn’t always read that way on paper. Loved your thoughts on germs. As the daughter of a research virologist I grew up so painfully aware of germs – so aware I sometimes thought I could actually see them. It’s taken a lot of determination over the years to relax and trust my immune system to handle most of them. I even sit down to supper now without washing my hands! I wonder if there’s some construction material that’s durable enough to withstand a tornado — concrete maybe? I also imagine the shape of the house could make a difference. But what do I know? Given the incredible amount of property damage that takes place every year, there must be engineers working on this problem. Obviously, they haven’t solved it yet. Like Barbara, I appreciate your view on germs. India, regardless of being a country with a largely dubious hygeinic routine, has one good thing — its people have robust immune systems. Mostly. And, you made me smile. Thank you. Do you believe there’s a connection, Priya? I think people with robust immune systems are the ones who don’t panic and try to avoid germs, but rather allow their bodies to build up a resistance to them. But as I said to Barbara, what do I know? Well, I’d rather err on the side of human-induced climate change. I don’t think people really panic because we’re wiping out nature. They’re panicking because we’re wiping out us. Long after we’ve strangled ourselves to death, nature’ll still be around doing it’s thing. I think it’s a matter of balance, Kitchi. Just as we do in our own homes, we need to figure out how to clean up after ourselves and replace what we take. If we create a toxic environment at home, we get sick and die; if we use some simple common sense, we get to live longer. Either way — as you said — the house will still be around. That’s exactly my feelings as well. Erring on the side of caution and all that… makes much more sense to me than (what could possibly be) suicidal denial. I think you should go on “Shark Tank” with your idea for a giant counter-circulating fan to battle tornados. Some guy was on there the other day that was going to produce gold from giant water turbines or some such. When you figure out how to put your underwear and pants on at the same time, that could be a goldmine for sure. Where the hell is my flying car? They’ve been promising me that since the 50s at least, and “Popular Science” at best had us with a helicopter in every garage by the 70s. And let me add, I’m right there with you on the texting while I’m asking for the eighth time if anyone would like more potato salad. Loved the post. What about some velcro-system for attaching underwear to the inside of the pants? I think that could work. I was talking about flying cars just yesterday with someone. It is kind of a letdown, but when you think about how some people drive on the ground, it’s probably just as well.